It's been said over and over again. And statistics show this to be true. Roughly half of a stocks price movement can be tied back to the Industry that it's in. Just like a rising tide raises all ships. A falling tide lowers all ships. Of course there are always exceptions. But in general, finding the best stocks in the best Industries will outperform the best stocks in the worst Industries. In fact, you'll often find that even average stocks in the top Industries will outperform great stocks in poor performing Industries. This being said, we've made it quick and easy in the Research Wizard to find the top Sectors and Top Industries. Moreover, you can also find the Top Stocks within those Sectors and Industries, all with a few clicks of your mouse. First, let's take a look at all of the different Screening Operators that are available from the main Screening Window. * These 'limiting' operators are sequential operators. This means that the order of the items using these operators is important. Note:"Top" and "Bottom" operators refer to the value of a data item and do not imply qualitative characteristics of an item, they just select the largest or the smallest value. Let's say you want to screen for the Top 4 Sectors with the greatest percentage price change over the last 12 weeks. Since we'll be looking for the Sectors and Industries with the greatest percentage price change, let's omit the extremely cheap stocks first so they don't skew our results. I generally use >= 5. But you can use whatever you prefer. But excluding penny stocks helps. Because even a few cent move on a 5 cent stock will show a 60% gain or more. And a 1 cent move on a 1 cent stock equals 100%. And you don't need too many of those to throw off your numbers. Now let's begin with our Sector screen. In the Categories Window, select Price and Price Changes. The Screen By Window will pop up and shown below. This means it'll find only the top 4 Sectors based on the average percentage price change for the last 12 Weeks. Note: If we selected the TopSectM #, we'd then pull up the Top 4 Sectors based on the Median Percentage Price change over the last 12 Weeks (M - meaning Median) instead of the Average. The Screen would now look like this in the Screening Criteria Table. Now let's say you want to narrow that list down a bit by drilling down into the Industries within that Sector. There are 17 broader Sectors. Over 60 Medium Sized Industries. And over 200+ Expanded Industries (or expanded peer groups). This means it'll find only the top 3 X Industries (within the earlier selected 4 best Sectors) based on the average percentage price change for the last 12 Weeks. Note: If we selected the TopXIndM #, we'd then pull up the Top 3 X Industries based on the Median Percentage Price change over the last 12 Weeks (M - meaning Median) instead of the Average. Note: When using the M Industry, (e.g., 'TopMIndM #'), the 'M' that precedes the Ind, (i.e., 'MInd'), denotes the M or Medium Sized Industry. The 'M' that comes after the Ind (i.e., 'MIndM') stands for Median (meaning the Median value as opposed to the Average value). Just like the A after the Ind (Industry) or Sec (Sector) stands for the Average value as opposed to the Median value. Now let's say you wanted to narrow that list down even further by selecting only the Top 2 stocks within each of the Top 3 Industries above that are within each of the Top 4 Sectors above, based on the best percentage price change over the last 12 weeks. Our screen is finding the Top 4 Sectors. Then it's finding the Top 3 X Industries within each of those Sectors. And now we're going to find the Top 2 stocks within each of those X Industries. This means it'll find only the top 2 stocks within each of the (3 best) X Industries, based on the percentage price change for the last 12 Weeks. Note: If we selected the Top# InSec, it'd then look for the Top 2 stocks within each of the Sectors. And if we chose Top# InMInd, it'd look for the Top 2 stocks within each of the M (Medium) Industries. Top 4 Sectors based on the Average Percentage Price Change over 12 Weeks. And you can do with virtually any item you choose. In fact, you can even do with a custom Calculation Expression item. Whether you're looking for the Top or Bottom Sectors or Industries. Or the Best or Worst stocks within those groups. Or even the entire Universe. It's easy to do with the Research Wizard. As noted above under the table of Operator definitions, the operators with the asterisk by it (*) which include the Top or Bot (Bottom) Operators (be it #'s or %'s) are 'limiting' operators and are sequential. Let's start off with an easy example to better understand this. The screen would now and firstly, search for the Top 10% of stocks based on the Projected Growth Rate from the entire Universe of stocks. Since there's approximately 8,600 stocks in the Research Wizard, this item would narrow it down to best 860 stocks. Then it would search for the Top 100 stocks from that list of 860, based on the 12 Week Price Change. This screen would produce 100 stocks. Here's another example using the Sectors and Industries. 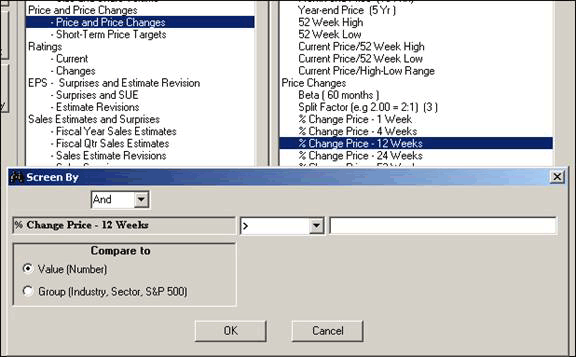 This screen would first find the Top 5 Sectors with the best 12 Week Price Change . Let's say they were: Energy, Basic Materials, Transportation, Utilities and Consumer Staples. Then from those 5 Sectors, it'd find the Top 3 X Industries within those 5 Top Sectors. This screen is first looking at the Top 3 X Industries with the best 12 Week Price Change. Let's say all 3 were Finance related: Savings & Loans, Banks, and Insurance. Then from those 3 X Industries, the screen would search for the Top 5 Sectors. But since there's only one Sector (Finance) represented in the previous criteria, only one Sector will come thru this screen (not 5). And it could (would in this example) be different than the first screen. Needless to say, you'll also get a different number of stocks as well. Left click on the item you want to move (it'll highlight in blue). While the order is important for 'limiting' or sequential Operators; the order is NOT important when using the regular (or Boolean) operators like: >, <, =, <>, >=, <=, In, Out. Regardless of what order you put these in, it'll return stocks that meet ALL of the above criteria. The order is irrelevant. The "Top" and "Bot" (Bottom) operators refer to the value of a data item and do not imply qualitative characteristics of an item. They just select the largest or the smallest value. For example: if you're looking for stocks with the 'best' P/E ratios (lower P/Es are generally thought to be better than higher ones), you would use the 'Bot' Operator. This will produce stocks with the lowest P/Es. If you used the 'Top' Operator, it would generate stocks with the highest P/Es. So if you want the stocks or groups with the lowest values and you've decided to use the 'limiting' Operators, remember that the 'Bot' Operator will return the lowest values and the 'Top' Operator will return the highest values - regardless of it qualitative value. Start searching for the Top Sectors and Industries in your screens today and get familiar with how this great feature works. Getting into the right groups can put the wind at your back.